Maybe you weren’t at home, or maybe you don’t have a garage or carport there. Your car got stuck in a hail storm. Yo u probably have a lot of questions, starting with, what now? If you just have a few dents, you may choose to just live with the damage. This will depend on your tolerance, of course, and also on your financial situation, the age of your car and your desire to resell it. You might choose to get the hail damage fixed by a professional. Depending on your bankroll, you may just pay for it out of pocket. You also might consider filing an insurance claim. Obviously, the heavier the damage, the more costly the repairs. 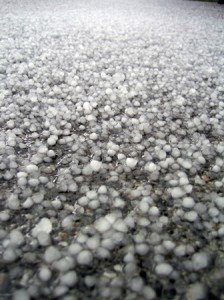 Does your policy cover hail damage? This may be the start and end of your insurance claim. What is your deductible? If the damage costs less to repair than your deductible, you may not need to file a claim. Will your rates go up? You may need to weigh the pros and cons of going through your insurance, including what it will cost you in premiums going forward. Can you choose your own repair shop? Your insurance company may have you take your car somewhere specific, so you’ll need to decide if you’re ok with that.